Our knowledge of Selmer's transistor based amplification is pretty sparse. 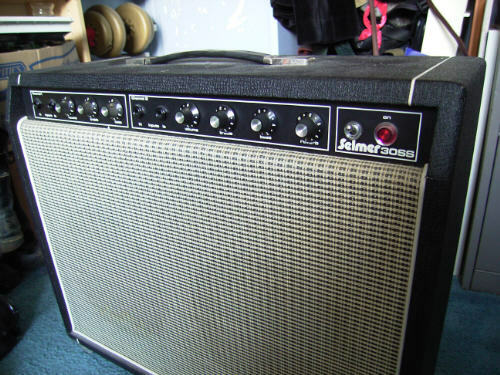 Solid-state technology appears to have been introduced into the Selmer range around the second half of 1965, with the introduction of the Taurus 60watt combo amp, which looked similar to the Zodiac and Thunderbird of the same era. Professional-level solid state amplifier heads appeared in 1972. Problems with reliability on the earlier models, together with the inevitable performance comparisons with valve amps led to the Selmer solid-state gear not being very successful. Perhaps this is why very few Selmer "Trannies" are around to-day. The replacement for the valve powered Little Giant, with 5 watts output through an 8" speaker. Two inputs were available, each with a separate volume control, but with a common tone control. A tremolo equipped variant was also available for a further 4 guineas. This little practice amp seems to have only been produced between 1968 and 1969 during the Black/Silver Period. Selmer's introduction into Solid State amps with 60 watt power output, through 2 x 12" speakers. Two channels with two inputs per channel. Both tremolo and reverberation controlled individually on each channel. The amp was equipped with a chrome swivel-back stand, fitted with castors. Introduced into the Selmer range in September 1965 as the blue/black Taurus 60 (initially without swivel-back stand), it changed its appearance, and its name to Saturn 60, in September 1968 during the black/silver period. The Saturn had disappeared by 1970. A simple solid state 15 watt amp, fitted with an elliptical speaker. Single volume and tone control, plus two input sockets. Initially introduced in 1970/71 with blue control panel. Later versions still in production during the Norlin period (post 1974), although with revised electronics. First version was designed by Selmer's John Lawrence. A short-lived solid state 30 watt amp using a similar concept to the valve-drive Compact 30SV. Two 12" speakers with volume, bass and treble controls controlling the single twin-input channel. Introduced around 1972 and soon discarded for the new Super Rever 30/30SS combo brought out in c1974. A 30 watt output amp, equipped with two 12" speakers. Two non-switchable channels, with simple volume, bass and treble controls. Reverb fitted to second channel. Produced from c1974 onwards, and initially described in the catalogue as the "Super Reverb 30".. This head unit was presumably intended to take over from the old valve driven Treble and Bass. Probably best to let the 1974 catalogue entry speak for itself - "A new solid state amplifier developed with working groups road managers in mind. May be switched from lead to bass on either channel. With a lead cabinet can be used for the whole range necessary for lead or rhythm guitar, and with a bass cabinet provides all the depth and tone required. Illuminated front panel. Two inputs for each channel, including... independent treble, bass, middle, presence, volume, reverb. Rear socket for external echo". Two types of speaker cabinet were available for use with this amp. The Lead 100 Cabinet was fitted with 4 x 12" speakers. (Perhaps a touch of the Marshalls here!). The Bass 100 cabinet was equipped with a single 18" unit, and was fibre glass lined internally. The catalogue states that this cabinet had been developed from the Goliath cabinet, which it presumably was intended to replaced. A solid-state alternative to the valve driven SV unit also appeared in 1972. Certainly, for a year or so, the two alternatives seem to have been produced in parallel. Interestingly, in 1974, the solid state version was much more expensive at £188 than the valve SV model at a bargain £109.50! 100 watts output, with six channels each equipped with volume, treble and bass controls. A single reverb depth control was fitted, acting on all channels, as was a master volume. Two Selmer PA 60H speaker cabinets were recommended for use with the PA100 amplifier. Each cabinet contained three 12" speakers plus a horn unit. Slave amps were very much in fashion in the 1970's for boosting the outputs from PA amplifiers and even guitar amp heads. This was the first occasion that Selmer produced such a unit. It was equipped with two input channels with two input sockets, a volume slider and rotary bass and treble controls for each channel. Selmer changed the styling of their amps sometime during 1974/75, and came up with slim looking amps. They also differentiated between Lead and Bass. Twin channel with individual rotary controls per channel for volume, bass, treble, and reverb. A dramatic change in style and capability from previous Selmer PA amps, this new 100 watt amplifier was combined with a 10 channel mixer, with volume sliders for each channel! Reverb was ialso included i the package. A simpler unit than the previous fully controllable twin channel slave, with now just one input with a single rotary control for input level. After Selmer had been taken over by Norlin, it would appear that all production was finally changed to solid state. An Equipment List found in the back of "Beat" Magazine from August 1979 lists solid state 100 and 200Watt bass heads, together with a selection of S.S. combos and speaker cabinets.